For the last three weeks I've been packing our things into boxes. We are moving in the near future and I think I may have packed close to a hundred boxes. I'm almost done, but the movers are going to finish what I don't get to...things like my Tiffany lamps and dishes, etc. Over the weekend, after packing some things in my craft room, I decided to take a break and do something I really wanted to do. I made some of my Christmas cards. I ordered them from HSN in a kit of 50 cards. There are five different themes to make and this is my first set of ten. All of the pieces were already cut out and you just use your imagination to put them together or there is a sheet that has a few of the designed cards pictured for you. I found it so much more enjoyable than packing boxes!! Much more relaxing. I've been stressing out a lot these last weeks. I'm not quite sure of the date we'll be able to move which kind of leaves things up in the air for the upcoming holidays. I know I'll be ordering Bob Evans Farmhouse Thanksgiving dinner this year which will be a first for me!! It's all made up and ready to take home and heat....then eat!! There won't be many here since we only have a pathway to walk through the downstairs and upstairs. The dinner serves 8 and I think we may have the 6 of us together for Thanksgiving. I've been a little depressed about it but hey when I think of all the other bad things that are going on in the world today I snap out of it. Things could be worse. The holidays are just a BAD time to be moving! You know, as I started to do this post, I used internet explorer...which I hate...I have problems with it all the time! I tried to upload these pictures and they kept failing to upload. Ugh! So I also have Google Chrome and thought I'd upload from there and finish out the post from Chrome, and guess what, no problems at all. It's always a good thing to have two browsers because I've also had some problems with my mixpod not playing in Chrome and had to move it to the bottom of my blog and now it plays as it should in both browsers. Go figure!! Jonquil from http://www.awhimsicalchristmas.com/ gave me that tip about moving it or it still wouldn't be working. LOL! So, these are my first 10 cards. I have two more sets made and I'll post those ones soon. I hope all of you have a wonderful week! Rocker Rod Stewart is ringing in the holidays with his first Christmas album ever. The album contains 13 traditional Christmas songs with guests Mary J. Blige, Cee-Lo Green, Michael Bublé and a 'virtual duet' with Ella Fitzgerald. It hits the stores on Nov. 9th. You can also find the track listing at the above link. You can listen to Rod Stewart's Silent Night HERE. You can watch a live Rod Stewart Holiday Concert on http://www.hsn.com/program-guide HSN Friday, Oct. 26th at 8:00 p.m. They will promote his new holiday album with an additional bonus CD. 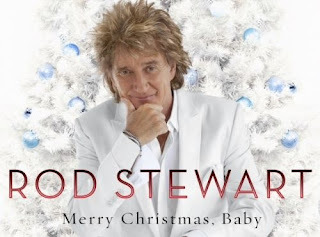 I've always been a fan of Rod Stewart and I can't wait to listen to his Christmas album!! If you're a fan I hope you enjoy!! Here's a link to the program guide for QVC'S all day Christmas event Tuesday Oct. 23rd. I see Valerie Parr Hill is on a few times that day and a few more in November. I LOVE her Christmas treasures! 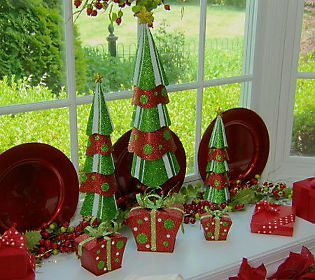 Even if I don't order, she gives great tips on making your home look beautiful and inviting for the holidays. Mark your calendar and enjoy!! 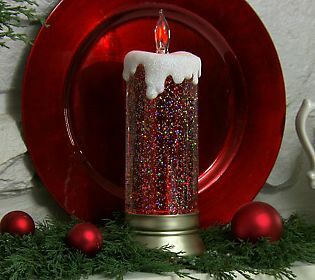 I ordered two of these glitter candles in the clear color the last time her show was on and I absolutely love them! Not battery operated...an extra plus for me as it seems that QVC is doing more battery operated items these days than electric as they used to do. Don't get me wrong, battery operated items are wonderful, but if that's all you buy, be prepared to spend lots of money buying batteries. I was glad to see something that was electric! This is just beautiful!! Someone on You Tube made this. It's a forty ft. long Santa's Toy Shop.